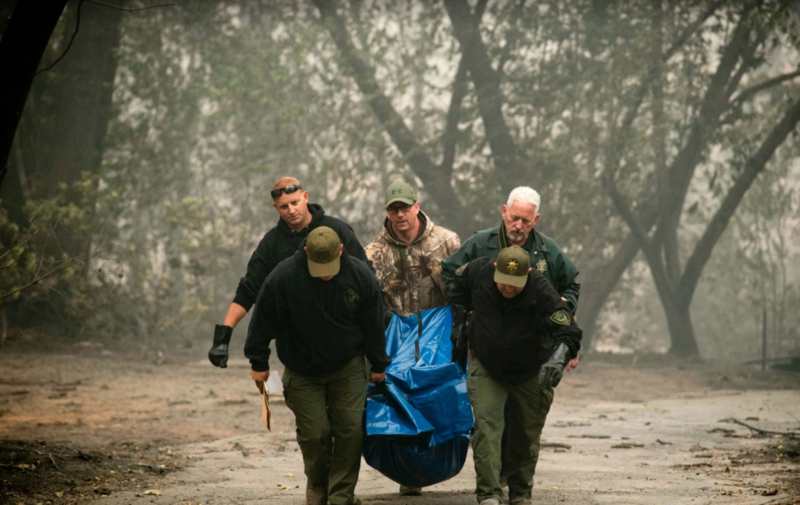 Just like the terrorists attacks on September 11, 2001, California is experiencing its own ongoing 9/11-scale attack marked by state-sponsored false flag environmental terrorism. 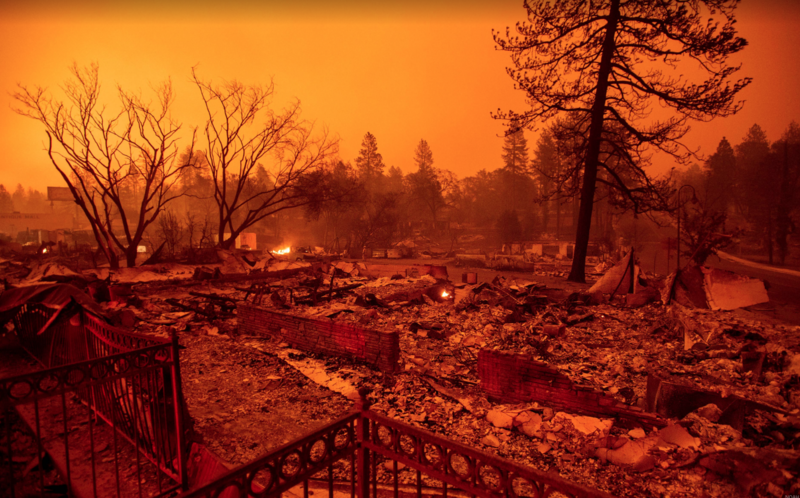 There’s really so much more going on with the fastidiously staged California fire apocalypse than meets the eye, and especially the conscious mind. Above all, this false flag terrorist operation is a P S Y O P. As is the case for every major psyop, this one has multiple goals and multifarious objectives. It also has all the hallmarks of mind control techniques in order to effectuate mass manipulation of the American body politic. One of the primary tools to accomplish this deliberate manipulation of the collective consciousness is to fabricate memes. Each meme not only stands alone regarding its effect, but also interconnects with the other memes that have been cynically crafted to move the masses in one direction or another. For instance, the following Google entry indicates 3 pieces of this California mind control project designed by the New World Order globalist cabal. 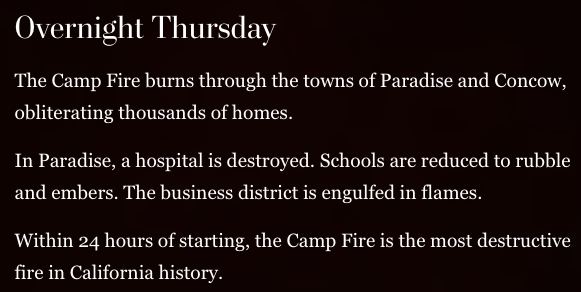 First we see the phrase “Camp Fire“. 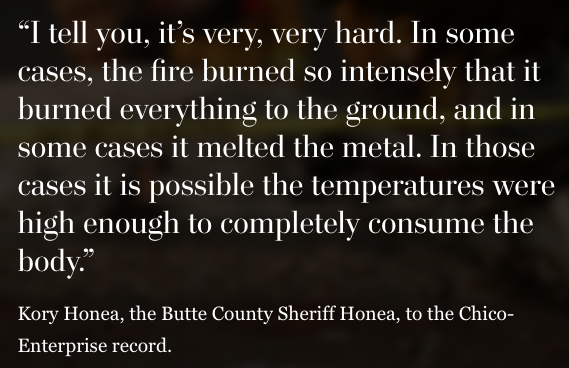 This is a way of misleading the public that the cause of the devastating Camp Fire was merely a small camp fire. And that campers can be very irresponsible, and even become unintentional arsonists. Then we see the word “Paradise“. 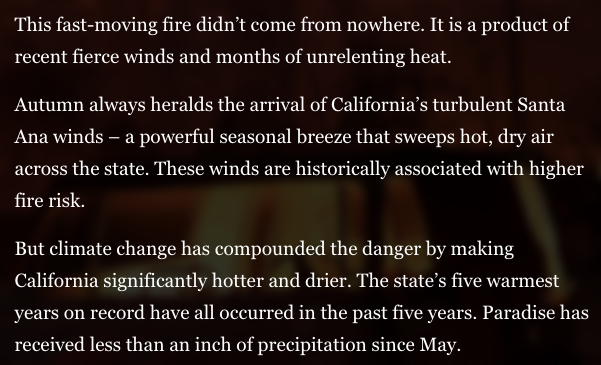 California, known as the Golden State, was once considered to be a paradise of sorts. 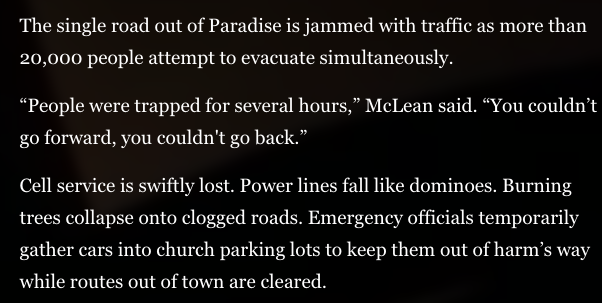 However, given the spate of problems of every sort and kind, it is now a “Paradise lost”. 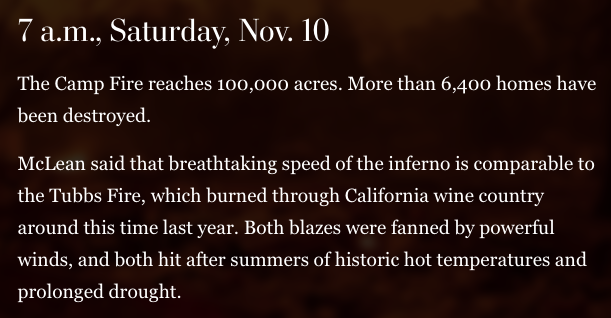 Not only that, but the Golden State is now charred black by one catastrophic wildfire season after another. 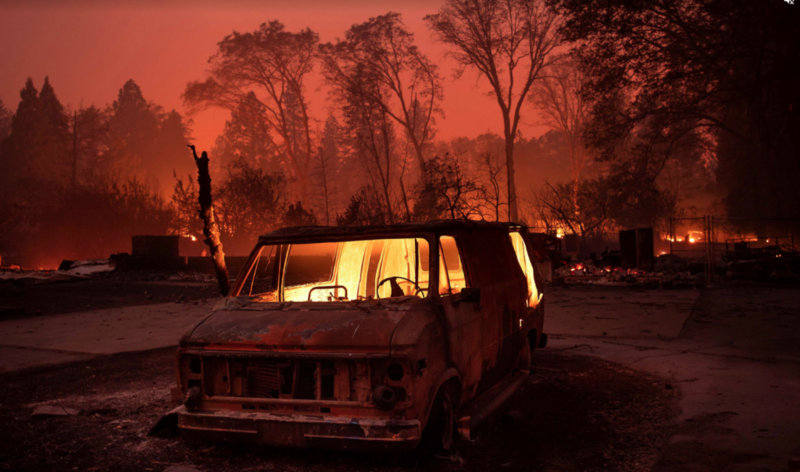 This is followed by the statement “start of the deadliest and most destructive fire in California history“. In other words, don’t even think of moving to California; the gold rush has been over for a long time. There’s nothing to see there anymore except a LOT of “death and destruction”. 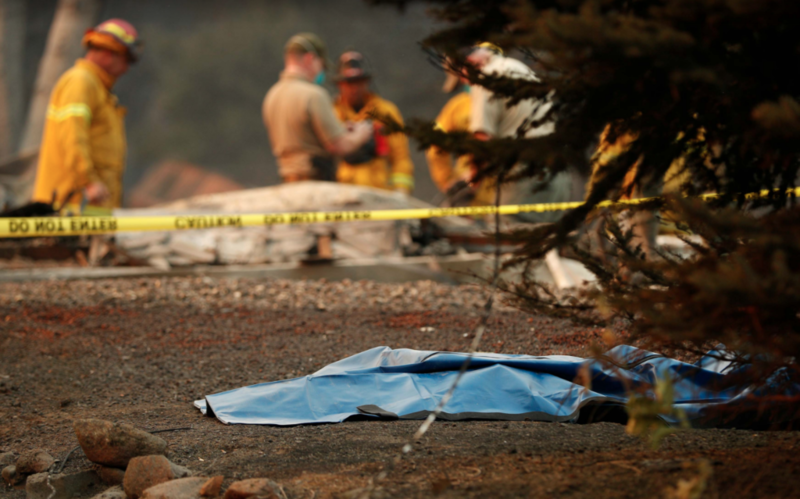 Therefore, it’s better for those who reside there to relocate to safer areas…and to any state but California. 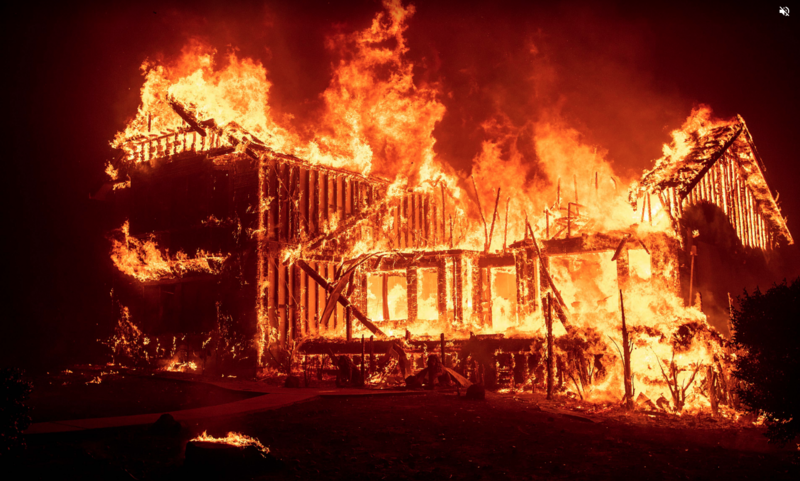 Lastly, we see the EXACT TIME that the fire started —“6:33 a.m.” How, pray tell, does anyone know the exact time that any wildfire ever starts… … …except those arsonists who actually started it, yes? ! ? ! And how about that ever-present “33” meme? 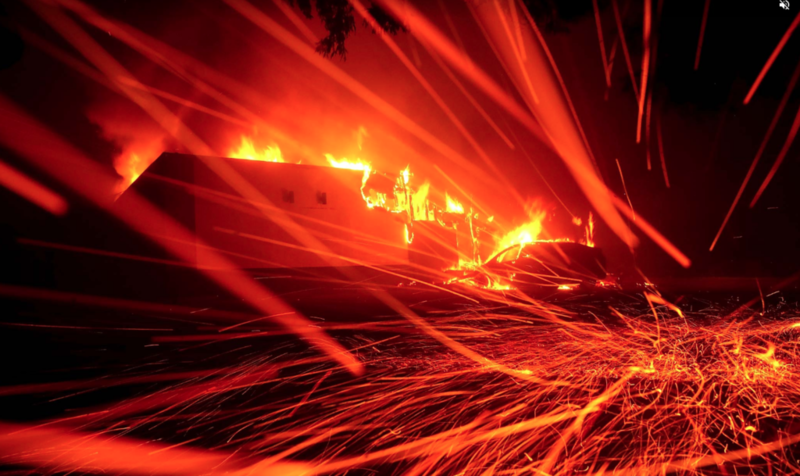 Now see The Washington Post headline and photo below which appeared above the most dramatic MSM piece of reporting on the Internet today about these calamitous California fires. 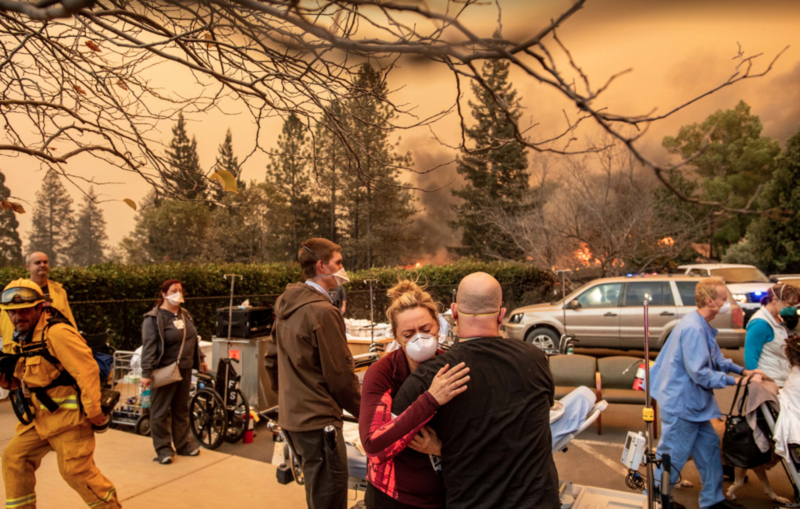 This photo-documentary can be viewed in its entirety at the following link: Caught in the Inferno: How the Camp Fire overwhelmed Paradise. Now let’s take a real close look at both the copy and the photos that were featured in this WashPo report. Each graphic below was captured as a screenshot as they appeared in order in the aforementioned WAPO special report. 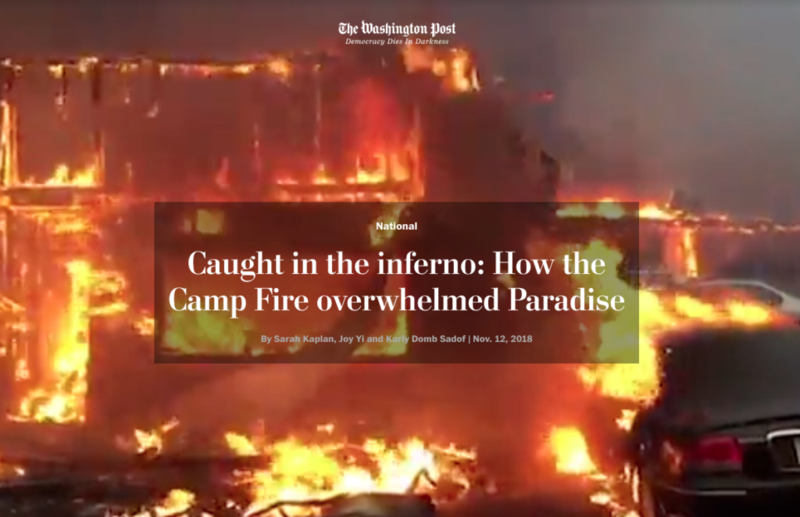 What every reader ought to glean from this quite impressive and captivating WAPO photo-doc is that the creators really want everyone to understand that these cataclysmic fires are the direct result of Global Warming. 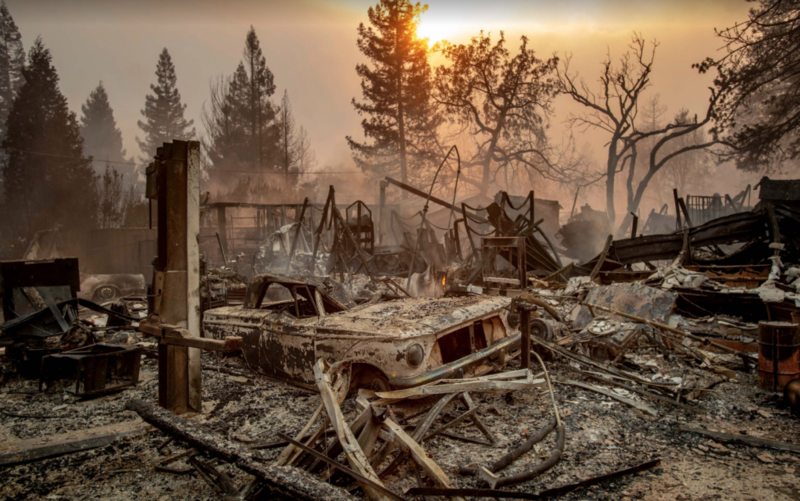 This piece of MSM propaganda was meticulously constructed to leave the viewer with a renewed sense of commitment to fight falsely contrived CO2-driven Global Warming no matter what it takes; otherwise your community may end up like, well, Paradise, California. Of course, no one is denying the existence of climate change, but it’s actually caused by two primary factors among several others. First and foremost is the regime of chemical geoengineering operations and globally-disseminated HAARP frequencies that are being covertly carried out in skies across the planet. 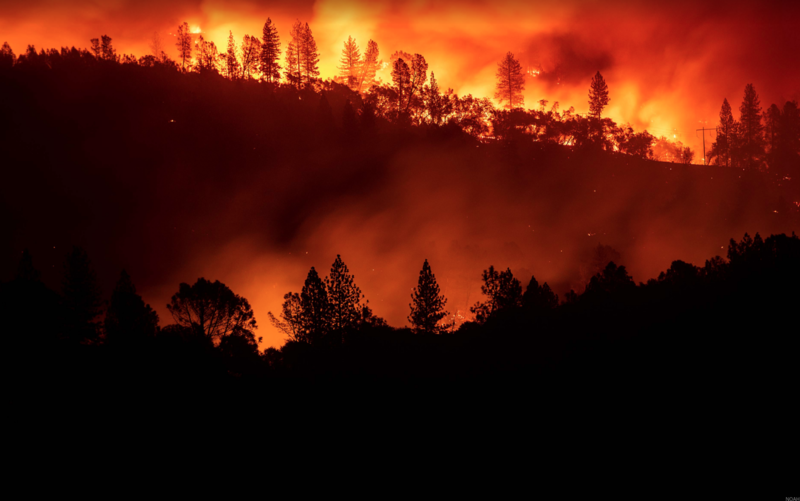 There are other significant factors involved in the uptick in climate change that has more of a regional effect than a single global outcome. Those are well-explained at the following link. 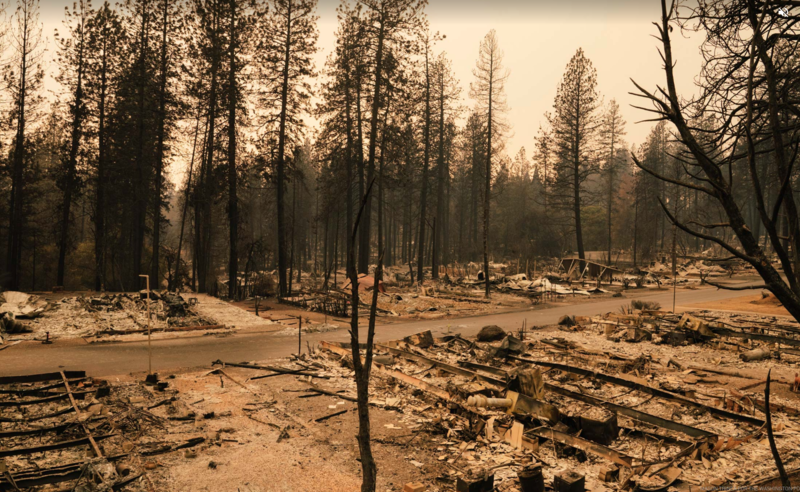 The California Firestorm psyop has many purposes. 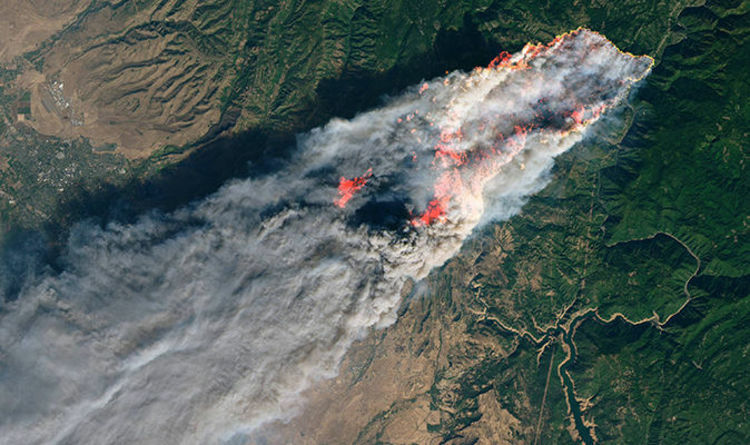 Selling the global population on the hoax known as CO2-driven climate change is a HUGE reason for these apocalyptic fires. That’s why they were so disastrous and why the media has so misrepresented their real causes. 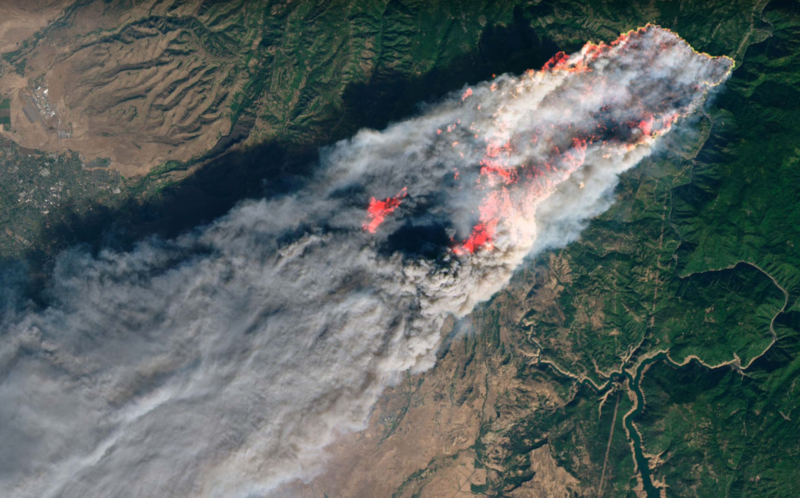 For those who wish to understand the true causation of these geoengineered wildfires, the following links provide the hidden back story. 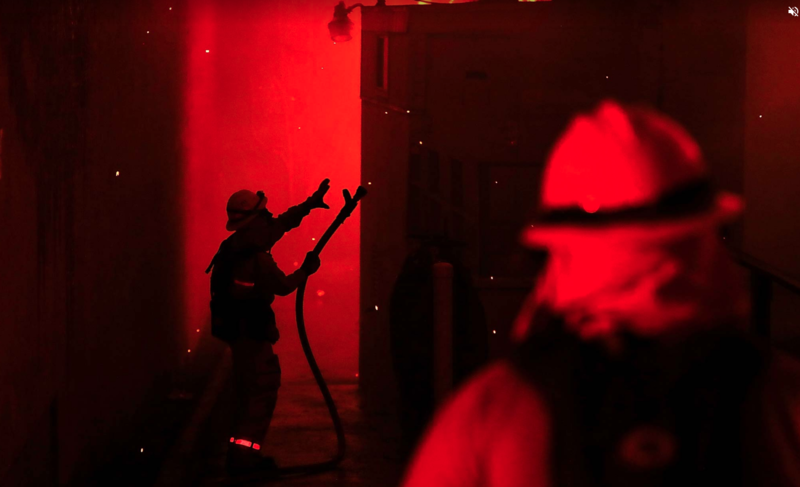 Who is firebombing California and why?